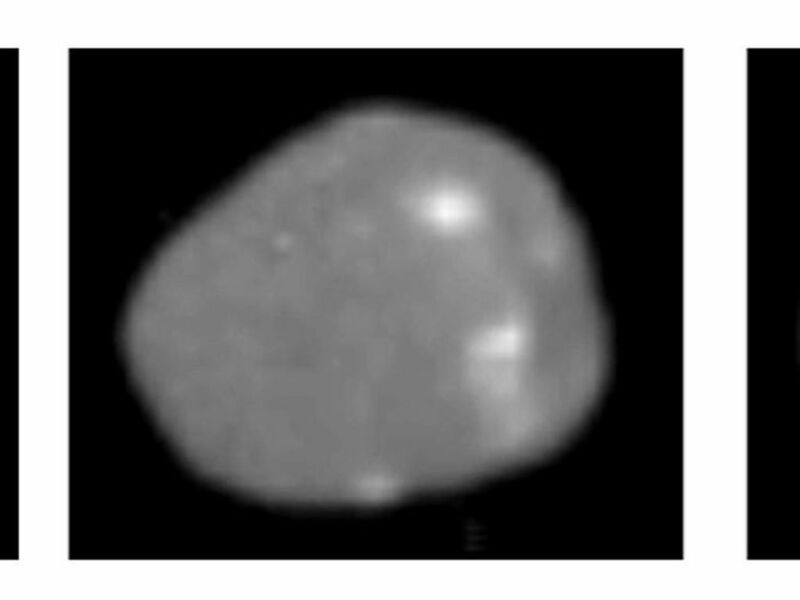 These images of Jupiter's moon Amalthea were taken with NASA's Galileo and Voyager spacecraft. Recent findings show that Amalthea is almost pure water ice, hinting that it may not have formed where it now orbits. This information challenges long-held theories about how moons form around giant planets. 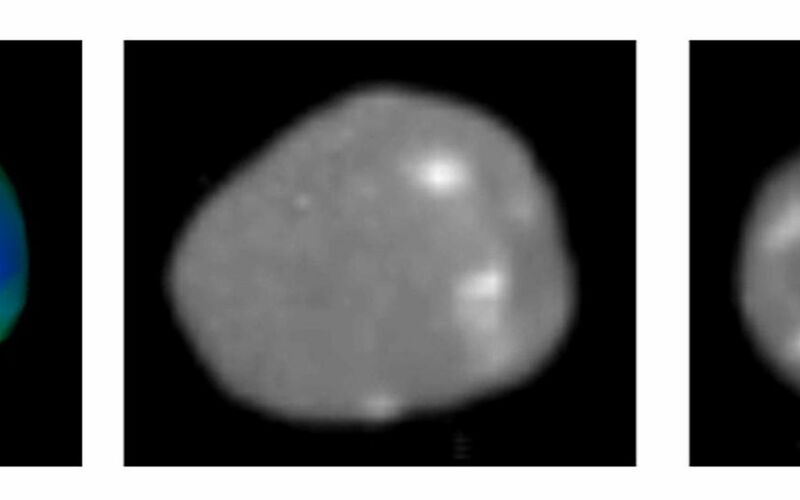 The image on the left shows the escape velocities color-coded on a shape model of Amalthea with the same viewpoint as the Voyager spacecraft image in the middle panel. Blue represents the lowest escape velocity, barely 1 meter per second (about 3 feet) near the anti-Jupiter end, while red (barely visible) shows the region of much higher escape velocity, nearly 90 meters per second (295 feet). The low escape velocities result from the low density of Amalthea and from its rapid rotation as it orbits Jupiter. The middle image is a composite from both Galileo and NASA's Voyager spacecraft (see PIA02530) and shows Amalthea from the anti-Jupiter side. The visible area is about 150 kilometers (93 miles) across. The Sun is behind the spacecraft, resulting in loss of visible shadows. The brighter markings on the ends of a ridge are prominent in this view. 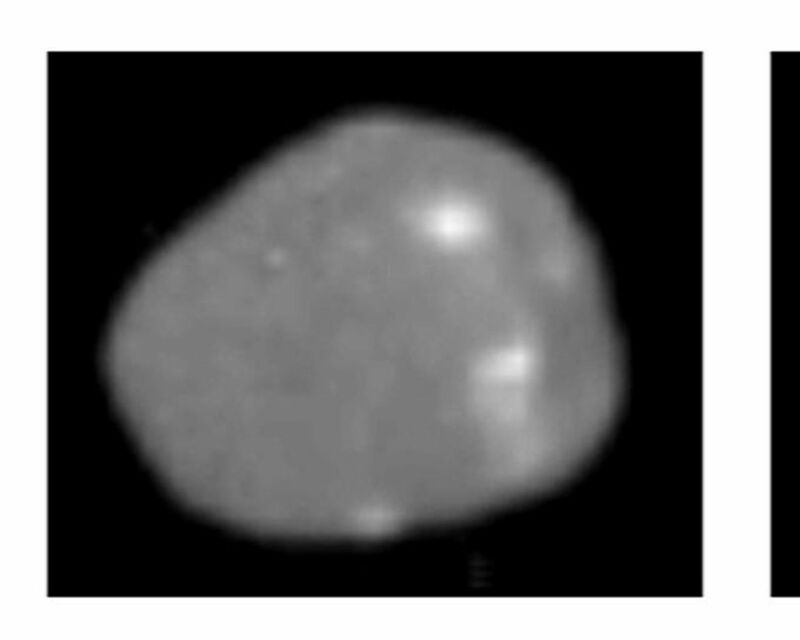 On the right is a Galileo image of Amalthea, (see PIA02532), with the bright spots on the end of Amalthea seen from the leading side of the satellite. Here the Sun is to the left and topography, such as the impact crater at the right, is visible. Amalthea is Jupiter's fifth largest moon. It orbits about 181,000 kilometers (112,468 miles) from Jupiter, considerably closer than the Moon orbits Earth. It measures about 168 miles in length and half that in width. Galileo passed within about 99 miles of the moon on Nov. 5, 2002. After more than 30 close encounters with Jupiter's four largest moons, the Amalthea flyby was the last moon flyby for Galileo. The mission began orbiting the planet in 1995. Additional information about the Galileo mission is available online at: http://galileo.jpl.nasa.gov/. Voyager information is available at: http://voyager.jpl.nasa.gov/.